It's safe to assume that we all know how to make pasta—you throw some spaghetti into a pot of boiling water, heat up or whip up a sauce on the side, and combine. But do you really know what it takes to make pasta like a true Italian chef? Even if you're not making your pasta dough from scratch, it turns out there are a lot more rules and tips for making pasta than first meets the eye. For instance, did you know to add lemon zest as a topping to bring out flavors? Or that you should never add oil to your pasta water? 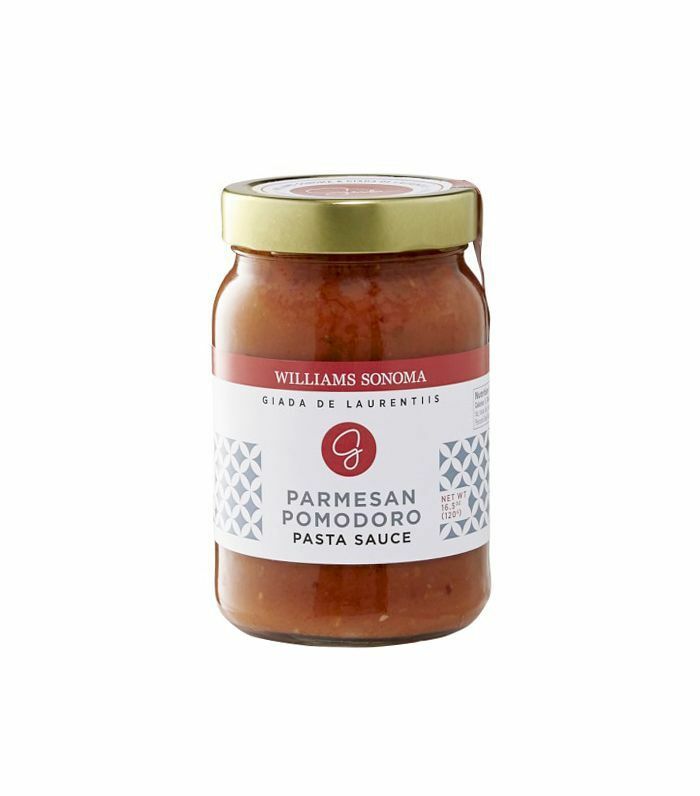 To demystify all the rules and old wives’ tales that come with pasta-making, we chatted with celebrity chef Giada de Laurentiis, who just launched a collection of pasta essentials with Williams Sonoma. With more TV shows and ninth cookbook on the way, we couldn't think of a better person to shed light on my the world of pasta making. Think you know all there is to know about true Italian cooking? We bet you can read to the bottom without picking up a few invaluable tips. MYDOMAINE: What are some of the recipes you like to cook when you’re short on time? GIADA DE LAURENTIIS: Well, pasta is the easiest one because it’s a blank canvas and you can add anything to it. Pasta is also something that many children, including my daughter, will request on a regular basis. So you have to get crafty and creative so it’s not the same dish every time. Chicken is a safe bet when you’re having people over, and the third recipe I cook a lot is meatballs. They’re all dishes that will last the next day, so if I make meatballs for dinner, I can make meatball sandwiches for my daughter for camp or for school. So I always think, Okay, what’s going to be great for dinner but is also going to be great the next day that I can reinvent and re-create a meal using the same ingredients? MD: What are some of your favorite pasta dishes to cook in the summer? GDL: For pasta, in the summer, I just change the toppings. One of my favorite pasta recipes in the summer is my lemon spaghetti. It’s just olive oil, lemon juice, lemon zest, basil, and Parmesan cheese. It’s almost like a thick vinaigrette because of the Parmesan cheese. I just cook the pasta, top it, and add the pasta water. You can top it with any protein you want—shrimp, chicken, or beef. That’s one of my go-tos because it’s so fast, easy, and it doesn’t take a lot of time in the kitchen when it’s hot outside. And the other one that I do is my fresh tomato pasta. I take fresh tomatoes, and I grate them on a cheese grater, and I add garlic, basil, salt, and pepper. And I let it sit a little bit. You can cook it in a pan or just add hot pasta to it, and then I add mozzarella. MD: Some say that you can’t mix cheese with seafood. What some other true crimes you shouldn’t commit when making pasta? GDL: I do believe that you can add cheese to a seafood pasta. That’s like an old wives’ tale. As for something you should never do to your pasta, I’d say it would be adding oil to the pasta water. It’s a big no-no. The sauce will never stick to the pasta if you add oil. You’ll just toss for eternity, and nothing will ever happen—the sauce will always end up at the bottom of the pan or the bottom of the dish. I think people just don’t realize how much water it takes to cook pasta so that it doesn’t stick together, but if you cook it with enough water in a large enough pot, it won’t stick together. You don’t need the oil. MD: What would you say is your secret to making next-level pasta? GDL: First, always add enough salt to the pasta water. A lot of salt. Because that’s the first place to season the pasta is in the water. So you think you’re adding too much salt, but it’s never enough. You have to really flavor it. Second, I always finish the sauce with a little bit of pasta water, because that gluten and that stickiness are what bind the sauce. And third, I finish it with extra-virgin olive oil and freshly grated Parmigiano-Reggiano. Those are my three keys: pasta water, olive oil, Parmigiano-Reggiano. And then, if you have an extra minute, a little bit of lemon zest on top makes all the flavors and aromas pop. MD: Is it true that each sauce has its specific pasta shape, or do you believe in mixing and matching? GDL: Traditionally, yes. Every sauce has its own correct pasta to serve with it, and a lot of it has to do with the flatness of the noodle, the ridges, or if there’s a hole that you want the sauce to get stuck in. So yes, there are certain rules, but at the end of the day, when you have a child, the rules don’t always apply. I let my daughter pick the shape, and even if it isn’t the traditional correct shape, I still do it. As a parent, you have to let some of those rules go and let your kids enjoy cooking and eating pasta—and part of that is allowing them to pick and choose. Sometimes I’ll influence her and pick a specific shape of pasta with a specific sauce, but a lot of times she has her own thoughts on how the sauces work with pasta shapes, so we explore together and I let those rules go. MD: Does your daughter have a favorite pasta that she always requests? GDL: Yes, she loves rigatoni—the half ones with the ridges, which, by the way, those aren’t always the easiest to find. And I make it with Bolognese. She’s a lover of meat and meat sauces. I usually mix it up—I make Bolognese with lamb, pork, sausage—I just change it up each time. MD: Tell me—what are the essentials that everyone should have in their pantry to be able to whip up great pasta at the last minute? GDL: Different shapes of dried pasta, good olive oil, anchovy paste, olives, red pepper flakes, Calabrian chili paste to spice things up, and garlic. MD: What are some essentials you need to make incredible pasta? 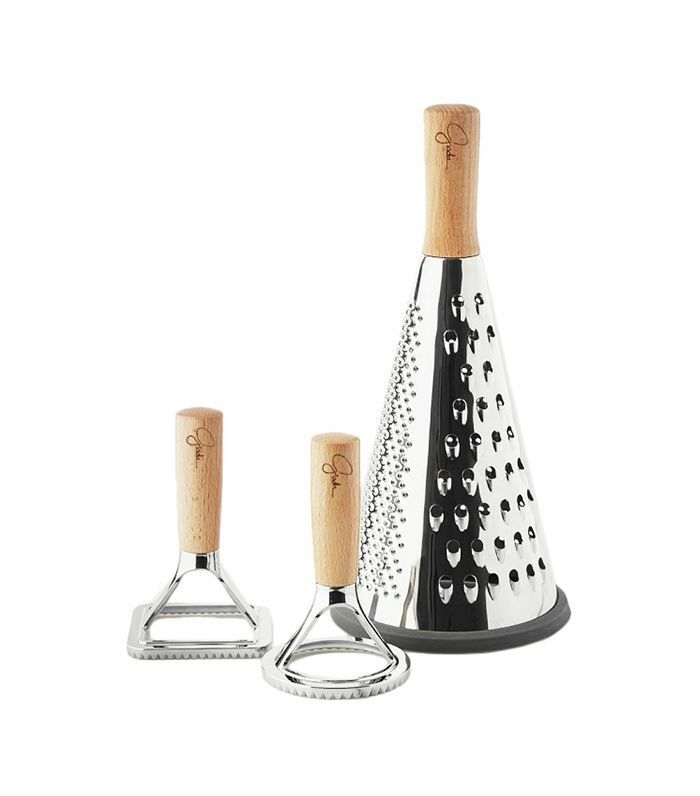 GDL: You need a great cheese grater for sure, because you’re going to need it—and that’s something I use a ton of. 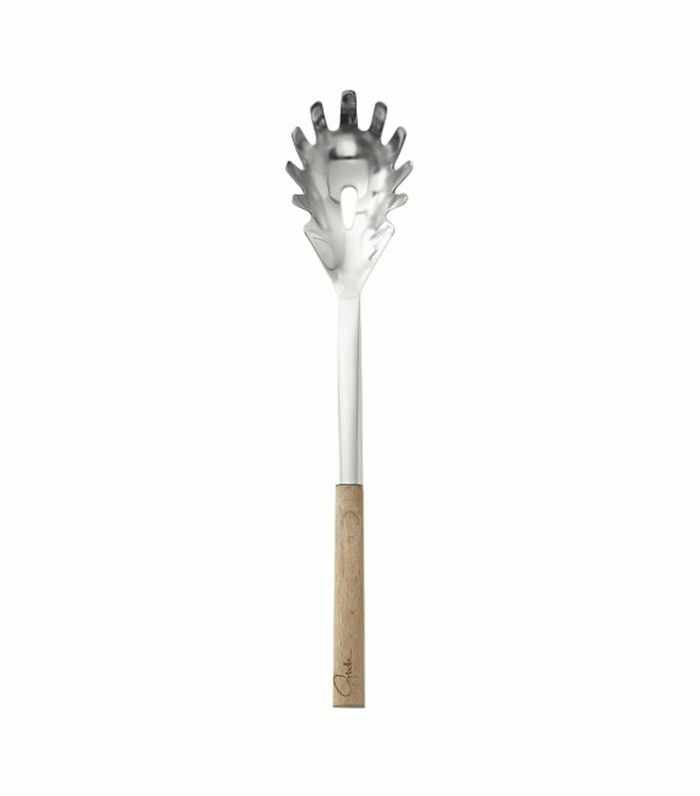 A good pasta fork helps grab and toss the pasta really well—so that’s a really good one. You need a big stock pot that can hold six to eight quarts of water. I think that’s always a great thing to have because it’ll allow you to cook pasta really well without it sticking together. And then I always say one sharp chef’s knife. You don’t need a lot of knives, but you need one good one that feels really good in your hand and that you have control of. MD: Some people think that making pasta from scratch is intimidating—what would be your number one tip to get them started? GDL: If you’ve never made handmade pasta, what I would do is buy pasta sheets and use the ravioli cutters and weigh them out. Make the filling from scratch, and then make the ravioli from there instead of making the dough from scratch so that you can start understanding the process, and you can start to enjoy the final product. Once you’ve mastered that part of it, then you go back and you make pasta dough from scratch. I always tell people to assemble first, get comfortable with assembling, enjoy assembling, and then move backward. If you’ve never made pasta dough from scratch and you don’t know what the final result is supposed to feel like, it’s not going to work. MD: What are some unexpected ingredient pairings that you’re loving right now? GDL: Right now I love ricotta cheese, Parmesan, and prosciutto together, and I love a sweet pea and ricotta filling. Those are my two favorites right now. We make a pea pesto tortellini at the restaurant, and we also make a prosciutto and ricotta filling. And then the third that’s really popular, especially in the summer, is lobster with mascarpone and basil—it’s a really yummy combo for a filling. To make the pasta, in a large bowl, whisk together the all-purpose and semolina flours. Create a well in the center, and add the whole eggs and egg yolks. Using a fork, break up the eggs; then gradually start to draw flour from the edges of the well into the mixture. When the dough becomes too firm to mix with the fork, switch to mixing with your hands. Use your hands to bring the dough together, adding up to 1 tbsp. olive oil if the dough is too dry. Transfer the dough to a lightly floured work surface, and knead until it is smooth and pliable for 8 to 10 minutes. Wrap the dough tightly in plastic wrap and allow it to rest at room temperature for at least 30 minutes or up to 2 hours. Divide the dough into 4 equal pieces. Lightly dust one of the dough pieces with all-purpose flour. Using a rolling pin, roll out the dough into a rectangle about 1/2 inch thick and no wider than your pasta machine. Starting with the pasta machine set to the widest setting, pass the piece of dough through the rollers. Fold the dough into thirds and pass it through again twice more. Continue passing the pasta through the machine, reducing the setting a notch each time. You may need to dust a bit with flour if the dough sticks to the rollers at all. Keep rolling until the pasta is about 1/16 inch thick—setting 4 or 5 on most pasta machines. Dust the cut pasta with more flour to prevent sticking. Repeat with the remaining dough. To make the filling, in a medium bowl, stir together the ricotta, mozzarella, mascarpone, Parmesan, breadcrumbs, nutmeg, salt, and pepper. Set aside. To assemble the ravioli, cut 2 rectangles of dough, each about 10 inches long and 3 1/2 inches wide, from one of the pasta sheets. Place one of the rectangles on a lightly floured work surface and, using a knife, lightly mark the dough into 3 1/2-inch squares. Place about 1 tablespoon of the filling in the center of each square. Using a pastry brush, lightly brush the exposed areas of the pasta sheet with the beaten egg. Place the second sheet of pasta on top of the first, aligning the edges and using your fingers to press around each mound of filling to remove any air pockets. Using a 2 3/4-inch round ravioli stamp, cut around each mound of filling to make individual rounds. The ravioli can be made up to 2 hours in advance. Place in a single layer on a floured kitchen towel, dust the tops lightly with flour, and cover with another towel. In a large sauté pan over medium heat, warm the pasta sauce until heated through. Reduce the heat to very low and cover the pan to keep the sauce warm while you cook the ravioli. And now, the one cooking hack Gordon Ramsay swears by for next-level pasta.